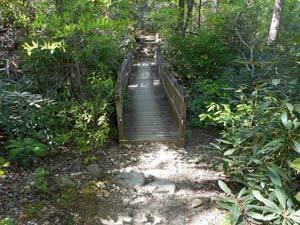 Chimney Rock State Park offers 10 trails for hikers to explore. 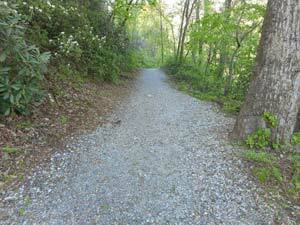 Six of these trails are located within the fee-based Chimney Rock access. 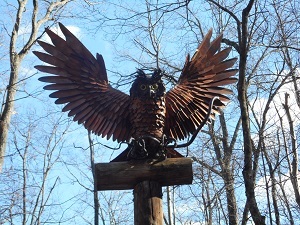 Four free trails are located at the Rumbling Bald access, the Eagle Rock Reserved Parking Area and in Chimney Rock Village. 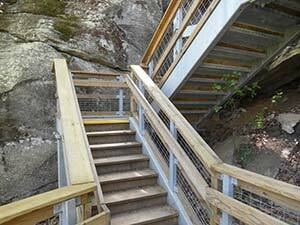 Accessing the top of Hickory Nut Gorge, the Exclamation Point Trail connects zigzagging paths with staircases to bring hikers to the edge of Exclamation Point at 2,480 feet. A steady tromp through the hardwood forest and past picturesque boulders gives hikers many opportunities to view the natural flora and fauna of the park. Leading to the base of the fantastic 404-foot tall waterfall, the gently sloping trail hugs the side of Hickory Nut Gorge and grants dramatic views of the towering cliffs above. 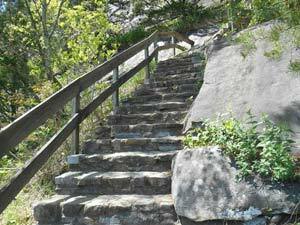 For those wishing to climb to the top of Chimney Rock itself, the Outcroppings Trail offers a series of staircases and lookout points threaded through a near-vertical boulder field.